In business, you often have to negotiate with other people. Maybe though, you have never been taught the proper principles of negotiation. "The process of gaining an agreement where all parties can arrive at a mutually beneficial and sustainable solution. It is a transaction where both have a veto over the final outcome. It requires voluntary consent on all sides." 1. Be clear about what you want. Know too, what you do not want. Knowing what you want is the critical step. Be specific. Know why you want it. 2. In negotiations, don't just agree to the first proposal. Saying "yes" to their first offer may leave you open to lose/win solution. Honesty in all your dealings, is the first principle. The second principle here is trade. You are not there to give your stuff away. Something for something. Not something for nothing. 4. Once agreed, stick to the agreement. If the other person wants to change the package, the terms must change too. Use the magic phrase, "Yes. But only if......"
Ensure you have a list of your negotiable variables. 5. Watch for bargaining activity just before a deadline. Deadlines can produce extra leverage, which can be used to gain an extra concession. So be emotionally prepared to use this fact, or resist it. 6. Avoid trying to "drive a hard bargain" by unnecessarily tough talk. It may be seen as intransigence by the other side. Take a tough position but keep your style professional and relaxed. "Tough talk" in the sense of needless over-assertiveness, is bad for business. 7. Record the details of each negotiation. Always record the details of negotiations, in writing. In case of a later dispute, what you write down may one day be useful information. 8. Always maintain respect for the other person's identity as you question his/her proposition. Always be polite. Never be rude to anyone. If it is to be sustainable, then there has to be genuine value in the solution for both parties. The basis of win/win is rational, tough, fair-trading. 10. Keep an eye on your emotional state. Stay relaxed and focused. Keep your cool. Our one-day in-house negotiation skills course will show you exactly how to prepare for a successful negotiation process. On this course, you will be provided with effective, practical negotiating skills. You will be able to use these skills immediately to improve your results. 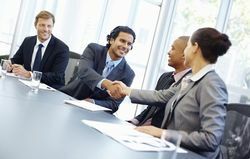 Negotiation skills training will enable your team to get the best possible results from any negotiation situation. We have designed this course to be well-structured, informative and fun. Do you ever think to yourself, "I know what I mean, but I can't explain it"? You need to be able communicate facts, feelings, information and ideas, in a clear, professional and confident manner. If you want to learn more about our communication skills training, please click here. People judge everything you say, what you do, how you look. Make sure they see you in a positive light. How can I communicate with more self-confidence?